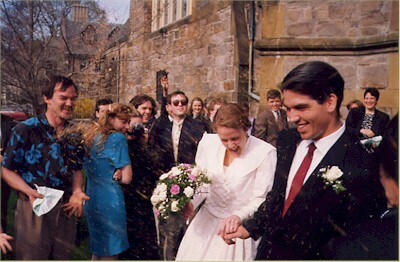 Nine years ago, Matthew and I were in Massachusetts for Tom and Amy's wedding. It was the first and only time I traveled on my own for a long distance with Matt and a wonderful trip. Matt, as usual, was exceptionally well-behaved and seemed to enjoy every part of the trip. As I recall, some of his highlights from the wedding were playing with a dog (and Vernon) and taking pictures with my camera. Needless to say, it's been great having Amy as part of the family. Tom will go down in history as having made at least one excellent decision. I like this action photo. What was it we were throwing, birdseed? Watch out! There's a big cloud of it just exiting Jon's hand.